Menu planning doesn’t have to be complicated. 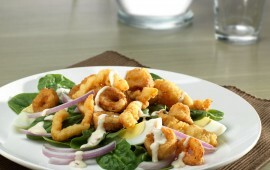 A salad of baby spinach, red onion, and hard-cooked eggs becomes a whole meal when topped with crispy calamari and clam strips. 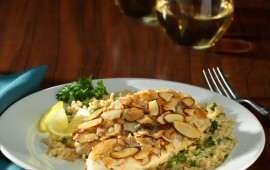 Tasty tilapia fillets, crusted with natural sliced almonds and pan-fried to golden perfection, will become a family favorite in your home. There are a million and one cold/flu remedies that can be purchased from your local pharmacy. But if your looking for a natural remedy or feel too yucky to get to the store one fantastic remedy is tea! Cheers! Here’s To Good Old H2O! We all know how important it is to stay hydrated, but we don’t always do the best job of it. Get tips on staying hydrated without adding calories! Chef Tom Gray joined us for our fitness and nutrition segment on Shannon Miller Lifestyle Radio this morning. 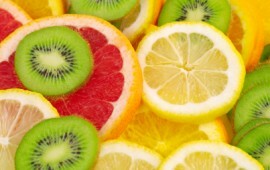 We discussed good nutrition for ourselves as well as our children. We also talked about great food. 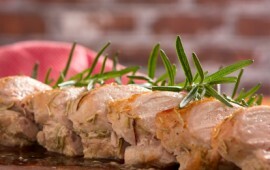 Create this delicious meal at home or save the time by booking at table at Bistro Aix!